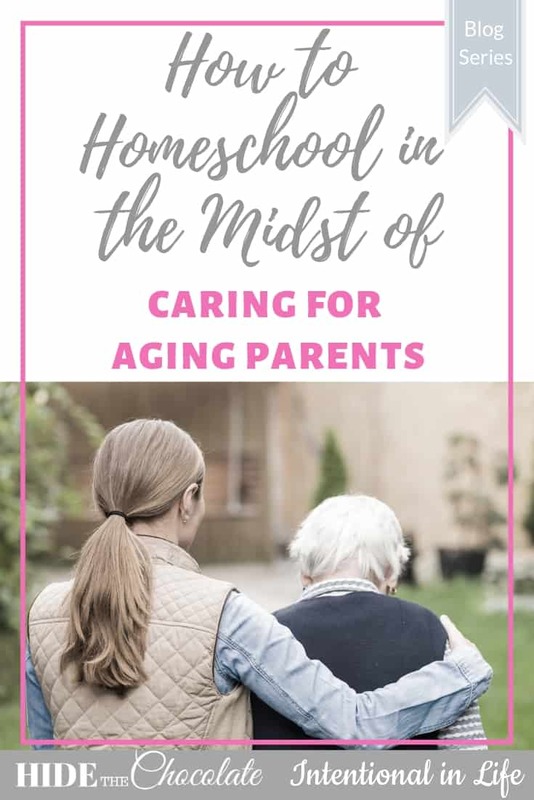 Today’s guest contributor, Meredeth Curtis of Powerline Productions, is sharing her story of homeschooling while she was caring for her aging and ailing parents. One day I was driving with my mom and had to stop suddenly. I reached my arm out to protect her and we both teared up. You see, she had always reached out her arm to protect me if there was a sudden stop, even if I was driving. It was a foreshadowing of what was to come. 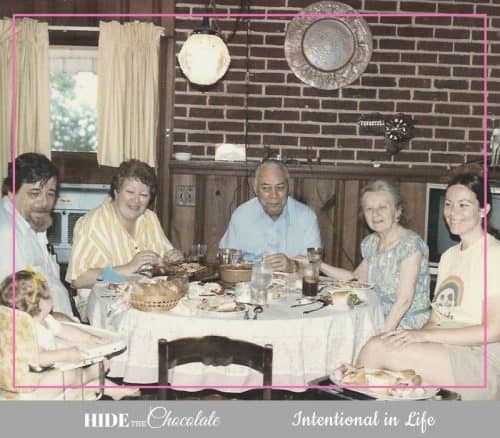 Five years later, I was about to turn forty, homeschooling my children ages 2 to 16, and my parents began to get very sick. My father needed surgery to remove rectal cancer and in the pre-surgery workup, they had to repair an aortic aneurysm about to burst and do a triple bypass. It was a scary time. 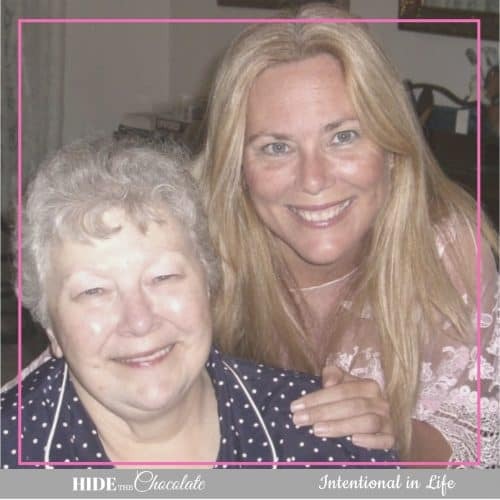 My mother was in a wheelchair due to complications with diabetes. Meanwhile, my parents were caregivers for my grandmother in her late nineties. I drove down to visit my father recovering from surgery in ICU. After a quick visit, I took the elevator down to see my grandmother in the ER. She had fallen and broken her hip. Meanwhile, I was potty-training a toddler, teaching Shine to read, helping Rosie memorize her multiplication tables, and helping my middle and high schoolers with advanced courses. How would I fit in caring for my aging parents? My parents’ health continued to deteriorate, and I started making the four-hour trip to their home twice a month or more. I felt so torn when I left home that I was abandoning my children. I felt torn when I left my parents that I was abandoning them. Everyone needs me, but I couldn’t be two places at one time. Then there was the emotional trauma. I loved Momma and Daddy. What would life be like without them? I was heartbroken. When I went to see my parents, I found it very difficult to have all the children with me. So I would leave one of my older kids and one of my little ones, taking the others. We focused on bare-bones homeschooling during that season, majoring on the majors and minoring on the minors. We did lots of reading and made sure to read the Bible and get math and writing done each week. In fact, I sat down and pondered what truly mattered in education and came up with 7R’s. (Later on, I wrote a book about it so even that bore good fruit). We also took advantage of all the teachable moments to learn about the human body, medicine, and diagnostic tests. They have all kinds of neat little booklets that we read together. It was a privilege to take care of my parents and grandmother and I’m grateful God gave me the opportunity, though it was very challenging. I saw good fruit in my children from the experience. There was genuine compassion in their hearts then and it is still displaying itself over a decade later. Besides uncovering the 7 R’s, I discovered I couldn’t do everything. Surprise! I had to rely on Jesus and His grace to be everything I so desperately needed but didn’t have in me. It’s funny that we always need Jesus, but when things are smooth, we get so self-sufficient. So silly, I know, but there it is. In the midst of all the chaos, heartache, and traveling, I had to rest in Him. When I blew it and lost things, forgot things, was rude, or acted selfishly, I repented and then received God’s forgiveness. It was during this time in my life that I realized how important receiving forgiveness is. I basked in it. I realized over and over that I can’t do it all, but Jesus is everything I need. And, I was amazed by His provision and care. One time, Rosie and I were driving to be with my parents for my dad’s open-heart surgery when my windshield wipers stopped working in the pouring rain on I-95. We pulled off at a gas station to wait for the rain to stop, but the water on the road splashed up so we couldn’t see. I had to pull off the road and knock at a stranger’s door to ask for help. When an elderly woman opened the door, I burst into tears. She welcomed Rosie and me in and served us tea. The husband went out, bought new windshield wipers, and installed them. And guess what? He had experienced the same surgery my dad was about to have ten years before. He reassured me. I felt so encouraged! God reminded me once again that He had my back. The greatest lesson my children learned during this time was what it truly means to honor aging parents by seeing it lived out. They learned that when things are tough, families come together and do what needs to be done. They saw how faithful Jesus was. There were many tender moments and lots of family stories that we talked about. Some stories I had never heard before. Those stories are part of my children’s heritage and precious memories to me. If you are caring for aging parents, then I have some advice for you. Realize this is too big for you; rely on the Lord. Continue to school but go lightly. Major on the majors and minor on the minors. Let your children know that you know this is a hard season and you wish they didn’t have to go through it. Notice and appreciate any effort your children make to show love and serve. Thank them profusely. Tell your parents how much you love them and that it is a privilege to serve them. When people offer to help you and make meals, receive their help. Ask people to pray for you. Tell your children you are proud of them and love them over and over again. Trust God to bring something beautiful from this season. He will! Most of us will find us in the season of caring for our parents at some stage. If this privilege comes when you are homeschooling, trust the Lord to help you through it. You and your family can not only survive but thrive. 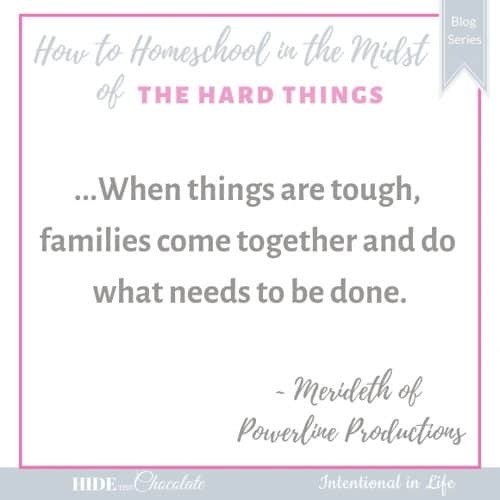 This is day 22 of the Homeschooling in the Midst of Hard Things Blog Series. We are so glad you are here! Check out the rest of the series by clicking the banner below. Meredith Curtis, happy pastor’s wife, blessed mom, and delighted grandmother, has been homeschooling since 1991. A speaker and worship leaders, she is also the author of Seven R’s of Homeschooling, HIS Story of the 20th Century, Travel God’s World Geography, Who Dun It Mystery Literature & Writing Course (high school), and the Maggie King Cozy Mystery series (Drug Dealers Deadly Disguise, Legend of the Candy Cane Murder, War of the Roses Mystery, and Murder in the Mountains), about a homeschool mom sleuth. She loves to encourage homeschooling families to enjoy their homeschool adventure with joy and success. You can check out her books, curricula, unit studies, and Bible studies at PowerlineProd.com . Free Reading Lists for all ages are available at JSHomeschooling.com. Read her blogs at MeredithCurtis.com and PowerlineProd.com and listen to her podcast at Finish Well Radio.